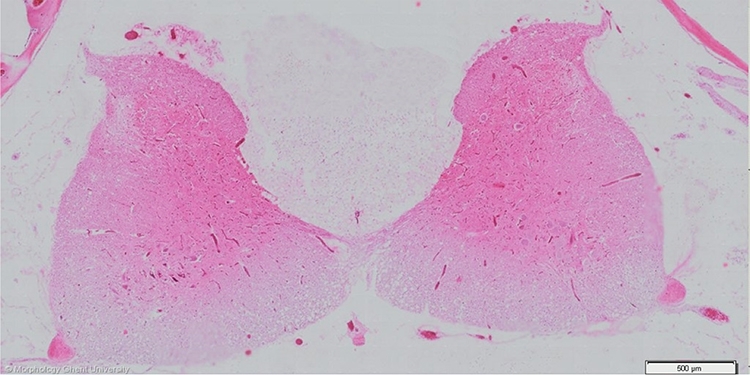 The gelatinous or glycogen body (corpus gelatinosum) is an egg shaped mass of glycogen-containing glial cells that is located between and piles out above the dorsal funiculi of the spinal cord. The glycogen body is covered dorsally by the pia mater and a pial septum separates the margins of the glycogen body from the spinal cord and divides the glycogen body in a larger dorsal part and smaller ventral part. Not visible on the micrograph above. The central canal (canalis centralis) runs through the ventral part of the glycogen body. The function of the glycogen body is still unknown. It does not respond to altering hormone levels or physiological conditions such as starvation. Lateral/dentate ligament: see accessory lobe of Lachi.